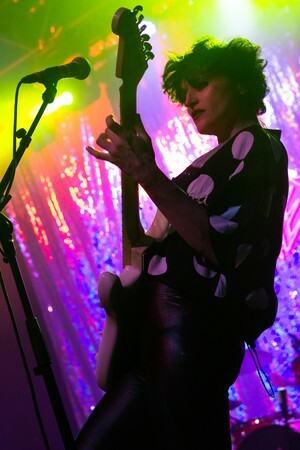 As Ex Hex took the stage at Thalia Hall last week, pink and purple lights bounced off a glittery, reflective backdrop to illuminate the crowd. The most ardent fans, pressed against the barrier, were bathed in the glow, which created halos that framed their salt-and-pepper hair. Yes, the majority of the crowd looked like they would never really know how to use Facebook no matter how long they’d had it. That is to say, they were somewhere near their forties. 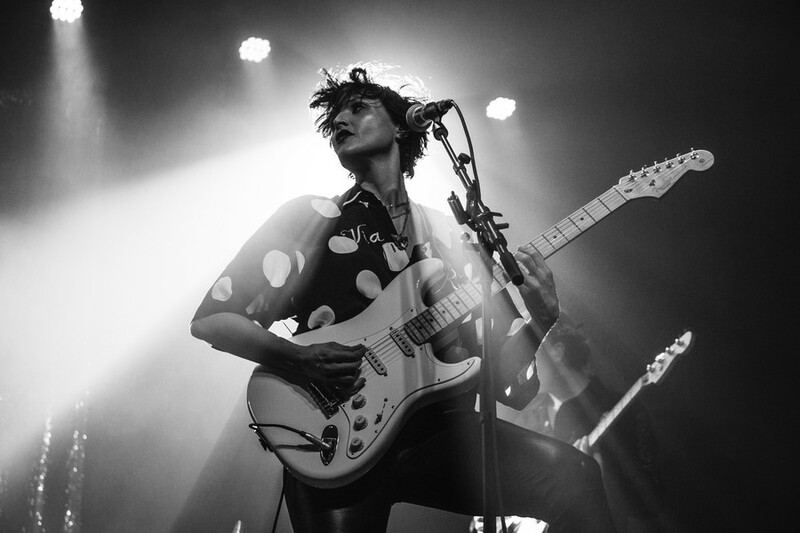 It makes sense—Ex Hex’s appeal revolves around alt-rock legend and guitar prodigy Mary Timony. Previously a member of Helium, Autoclave, and Wild Flag, most of her fans have been with her since her tenure in the former, back in the ’90s. That’s fine! Ex Hex has a more synth-heavy, ’80s-rock feel, which probably resonates with people that have actually experienced the ’80s. It would be easy to call Timony a has-been, and to write Ex Hex off for trying to recreate a scene that you just can’t recreate—not in a venue as impeccable as Thalia Hall, nor with the type of crowd Ex Hex attracts. But it seemed, as the show went on, that everyone was happy to be there sober, swaying benignly, enjoying an inarguably talented band and their music. So maybe there are no has-beens—only musicians who have transformed a nostalgic sound into something else, distinct yet reminiscently good. Ex Hex made their debut in 2014 with their album, Rips. Those 12 tightly-wound tracks fueled several successful years of touring. The album might be a surprising contrast for fans of Timony, whose sound was previously very different, but it’s upbeat enough to reel them in anyway. “Don’t Wanna Lose,” the obvious standout, is a frenetic, melodic introduction to the group’s sound. However, their new album, It’s Real, unwinds a little. It’s clear that the group has relaxed into a more garage-rock tone, but their technical skills and ’80s aesthetic keep the act from becoming too disheveled. Moaning, a post-punk band from L.A., opened for Ex Hex. They were visibly younger and more male than the main act, but evoked a similar sense of recreating an “unrevivable” scene. Their angsty, explosive set was spot-on, and clearly resonated with the audience. They were probably a perfect, if not obvious, choice to open for Ex Hex. In a way, they both performed the same sleight of hand: borrowing heavily from nostalgic genres. Despite being a truly solid act, Moaning was a bit eerie, in that they were in their twenties and were regurgitating a very modern version of post-punk to people who have probably witnessed the birth of this genre. They were aware of this, though, and fearlessly put forth a mushier version of punk than what the crowd would have been used to. At one pont, lead singer, Sean Solomon, sat on the edge of the stage and candidly delivered a break-up song as if he was hashing it out in that moment. By the end of the song he sang to the lights above him while lying on his back. His soft-boy bowl cut and clean-shaven face added to the juvenile vulnerability of this moment, one of the most honest of the whole set. He was acting his age, which felt more nuanced than the band’s earlier, more literal take on the genre. Moaning was an unexpected gem, but Ex Hex was better, in the savory, intangible way that an experienced, technically strong band is. Mary Timony and Betsy Wright, the bassist, came out in leather skinny jeans, patterned shirts, and ankle boots. Aging female rockers don’t often get the same evergreen spotlight as their male counterparts do. Rather than judging American Idol, they must settle to make occasional TV appearances on shows like The L Word and Portlandia. Nonetheless, many rock legends like Timony keep innovating—a silver lining in this patriarchal gray cloud.